Ipoh food is possibly the most talked about food topic. Being known for its bean sprout (taugeh) chicken, dim sum and salted chicken, very few would deny that Ipoh is a food paradise. Despite being born and raised in Ipoh, I must admit that I’m not a big fan of the food in Ipoh. For example, I find that the bean sprout chicken is overrated. Whenever I’m in Ipoh, I don’t go on an eating spree. Even though they’re already famous for being the true origin of the well-known Old Town White Coffee restaurant chain in Malaysia, this humble outlet still stands strong and is obviously not showing any sign of slowing down anytime soon. Since it’s only a single shop lot, the tables and seats are limited. Therefore, it can be really crowded at times. But it doesn’t take long before you get a table and start feasting on the local “street” food. Very common, but the char kuey teow (stir-fried ricecake strips) here is good. Look at the generous amount of prawns and bean sprouts. 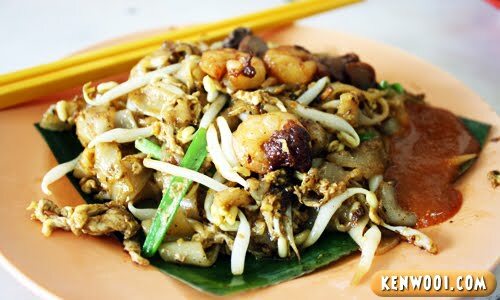 However, the portion could be small for char kuey teow lovers. You know, most of the char kuey teow I had elsewhere are either plain black or just tasteless. But this one in Ipoh deserves my recommendation. 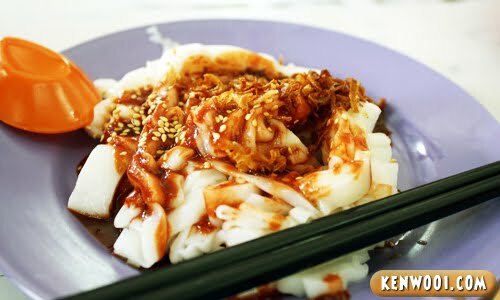 Another favourite would be the chee cheong fun with sweet red sauce. Also known as the rice noodle rolls (which have been chopped into segmented pieces), it’s a fairly ordinary dish. But what I love about it is its simplicity. Just mix with the sweet sauce (or if you prefer, with mushroom gravy) and sprinkle some sesame seeds, it’s ready to be eaten. Simply delightful. My most preferred dish at Nam Heong is the dry Hakka Mee. I’ll order this every time I drop by. The noodles are springy and chewy, topped with mince meat and spring onions – it’s also a simple dish, but I love having it. Oh my, I’m so tempted to drive back to Ipoh right this moment just to savour this wonderful Ipoh Hakka Mee! Besides that, my typical meal at Nam Heong is accompanied by some crunchy deep-fried… stuff. In Cantonese, I call them “liu” but in English, they’re called fried fritters. 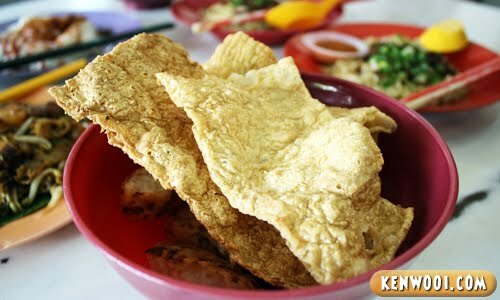 If you’d like to have a wider range of fried fritters, check out Pasir Pinji Big Tree Foot! 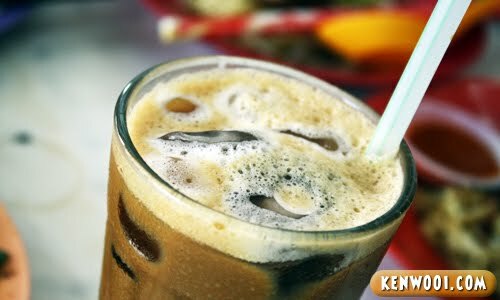 A perfect glass of chilling white coffee on a hot day in Ipoh. Flavorful and aromatic, that’s the 2 words I’d describe it. 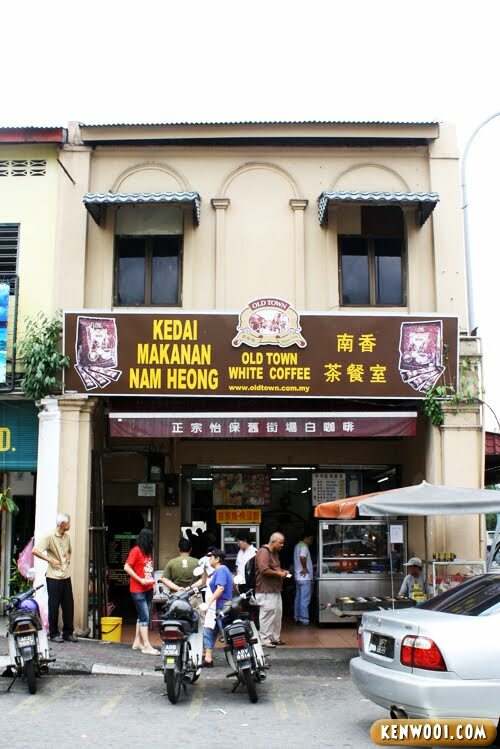 This is the originator of the Old Town White Coffee? Wow! Must be good! Wow! Love the hakka mee though I have not tried it before! Yummy! Love these types of food…look absolutely yummy! Drool!!! The hakka mee should be the same as Kuching kolo mee – lots of Hakka in Kuching originally… Hope to try that some day to confirm whether it’s the same or not. GOSH !!! Drooling all over my place here… !!! I didnt know they have this hakka mee there.. ok, must try next week!! each time i go, i take the hokkien noodles only..
From the color i know the coffee is good. Ipoh! Never been there lei! The food all so tempting! Yes…this is one of the best in Ipoh and that’s where old town white coffee started. It’s always crowded whenever I’m there ! I love the fried noodles with Liao ( yong tau foo) the most! was there this morning :) awesome place ken.. I was in Ipoh a fortnight ago and fell in love with its food. I visited nam heong and tasted the hakka mee, chee cheong fun and of course as a passionate coffee lover, the IWC……just LOVe it!! !